Former Together trustee Dr David Abrahamson gave this address at a special Memorial Service held at St James the Great, Friern Barnet. David’s words give an insight into the challenges our founder met with enormous humanity and remind us of the lasting influence of his work. We’ve also published a downloadable leaflet which carries the full story of Henry’s life. I feel very privileged to have the opportunity to say a few words about the Rev Henry Hawkins at this Memorial Service to mark the centenary of his death. Admiration for him grows as you learn more about his life and work. The characteristic that is most immediately striking is his persistence and steadfastness. 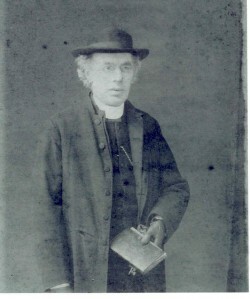 He was of course Chaplain to Friern Hospital, or Colney Hatch Asylum as it was then known, for 33 years from 1867 onwards. It had been opened in 1851 with a great deal of fanfare as the most modern asylum in Europe, but was almost immediately condemned for flying in the face of enlightened opinion of the time. Mortimer Granville, who inspected the metropolitan asylums on behalf of the Lancet medical journal in the 1870s, pithily described it as ‘a gigantic mistake’ – it started out with 1,250 and grew to 2,700 beds – and drew attention to the drab interior; the long narrow, overcrowded wards, which he described as comfortless and cheerless, the oppressive corridors; and the prison-like airing court, the only access to the outside for many patients. That environment must have been very daunting for Henry Hawkins and he could have been forgiven for losing heart and doing only what he had to do. His religious duties were certainly very important to the patients, several hundred of whom attended the Sunday Service. He also had responsibility for the sad business of funeral services for patients who for some years were buried in the grounds, and introduced markings for their graves which until then were anonymous. But he did much more than his immediate duties required. He built up the library service so that in one year 2,500 volumes were circulated. That must have meant a great deal to patients, many of whom were confined to their wards or even bedridden. He also increased the number of volunteers in the hospital: they befriended patients, read to them, wrote letters on their behalf and helped them in practical ways, sometimes financially. Even 100 years later it was difficult to attract volunteers for long-stay wards in mental hospitals, and it must have been a difficult task to build up this befriending service, and furthermore to keep it going. There was always a tendency in large asylums and hospitals for such developments to peter out. The accomplishment that we are particularly celebrating today is the founding of an After Care Association, and again one is struck by his perseverance. Various reforms of the asylum-based services were in the air in the era in which he worked. Alas, most either did not get off the ground or did not last and it is extraordinary that the Association he founded, which became Together, has continued for so long. I wonder whether one of the reasons he managed to get it going and keep it going is that he seems to have been a very friendly, humorous and modest man who did not seek recognition for himself. One of the problems for other schemes was that people made claims and counter-claims and rivalries developed. I wonder if he avoided a lot of that. He was certainly a man of principle and was clearly very influenced by what was called the Moral Treatment Movement, which is as topical now as it was then. Indeed, the modern Recovery movement, which is very influential in the mental health world incorporates some of the same principles. One can say that with Together some of his principles have survived right through to today, although they were often lost elsewhere. The basic principle is that we all share a common humanity: however poor, ill, or forgotten a person may be, they share our common humanity. That wasn’t an easy position to maintain at that time: there were counter-influences, including misunderstood evolutionary theory – the so-called Social Darwinism of the Victorian polymath Herbert Spencer, with a populist version of his ‘survival of the fittest’. There was a developing fear, hatred even, and denigration of what was called an underclass, amongst whom were included the mentally and physically ill, the poor and criminals, all lumped together. There are of course echoes of the same attitudes now. But Henry Hawkins always managed to maintain an optimistic view, which can be seen in all his writings, and he seems to have deepened his knowledge of patients and their lives over his time at Friern. His practicality is evident in the areas on which the After Care Association concentrated from the beginning: work, accommodation, finances; and also friendship. I wonder if perhaps he was influenced by what might have been a lonely childhood, as his only sister was 15 years younger and sadly died at the age of ten, and he was educated at home. He had a large family himself and it seems clear that in addition Colney Hatch was to some extent like an extended family for him. It was remarkable that that could be the case in those surroundings, but there is no doubt that there was human warmth and altruism even in that setting, amongst both patients and staff. I think it is very pleasant to remember that not only did he leave behind the practical legacy that we see in Together, from which so many people have benefited though the years; but also an emphasis on the value of human contact and interest. The first name of the Association indicated that it was intended to help ‘friendless’, as well as poor, patients. I like to think that both directly and indirectly he gave personal warmth to many people and also got it back from them: even under those circumstances and with the dreadfully severe illnesses of that time, patients were able to give warmth back. Again, I feel very privileged to have taken part in this memorial service. Read about the history of Together.